The Experimental Mom: Crash and Burn! I flopped the Raw Food Challenge. Totally the wrong plan for me at the wrong time of year! I am still working on my weight, but have just gone back to the good old calorie counting. I am also taking a blogging challenge from my pal Desiree... 28 posts in 28 days! So here is day 1 of 28! Also, I will close with a picture I took of Henry on Sunday. 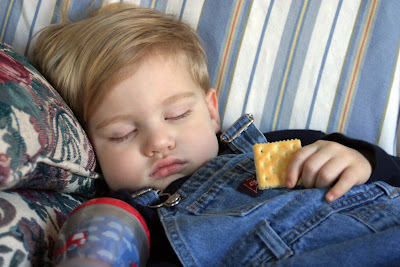 He fell asleep mid-cracker! lol! My poor sleepy baby boy!